Being ever so slightly food obsessed myself I thought I’d show you some bits and bobs I’m loving this festive season, to give you inspiration on what to buy for the foodie in your life. So here are my festive Christmas picks for food (and drink) lovers..
I’ve made no secret of my love of these baking boxes. A nifty subscription, sending a monthly box with (almost) everything you need to whip up a stunning bake. It inspires and challenges each month and is a chance to join a lovely little baking community that’s forming. These boxes are perfect whether someone’s a baking stalwart or has just picked up a whisk. 3 Months is £33.75. For any cookery book addicted foodies such as myself, this is the DREAM gift. Each month a book is personally picked for the recipient, beautifully packaged and sent out to them. There’s a spectacularly personal touch with The Willoughby Book Club, they really think about their customers, their likes and dislikes, meaning that each gift will be spot on. A really special treat for book lovers and foodies alike. £44.99 for 3 months. This personalised “open 24 hours” chopping board is a tongue in cheek nod to all of us foodies that spend most of our life in the kitchen. A sturdy wooden board, the perfect size for chopping and prepping Christmas lunch, this is a gift that will last for years and be enjoyed every time it’s brought out. £24.99. The Beanies Christmas box contains 9 seasonal flavoured coffees. Sugar free and suitable for vegans and vegetarians, these make a great change from some of the sugar loaded commercially sold Christmas coffees. Really unique flavours to pick and mix. A fantastic gift for flavoured coffee fans (and also Slimming World friendly for me – hurrah!) £22.50. Every food lover needs a brilliant set of knives in their kitchen. These elegant, stylish knives cut beautifully and are something a little different, with their distinctive angles. They look fantastic on display and are a purchase for life, with an affordable price tag. They are £69.90 for the 4 knife set and £89.90 for the knife block. I always seem to be baking something or other in the oven at this time of year, cakes or casseroles or quiches and these gorgeous dishes are perfect for adding a special touch to any dish appearing from the oven. Just the right size for a dish for two, they are £12.00 and come in three colours. A great gift for sweetie lovers (and who isn’t?!) Each month they can choose from hundreds of sweets to pick and mix their own box or choose from a pre-selected range. Beautifully packaged, this would be a real treat to arrive through their letter box each month. The Christmas sweets that keep on giving.. From £9.95 (first box £7.75). How about giving the foodie in your life the gift of food to share with someone else? You could buy them the gift of giving a goat to someone who really needs it for £25.00 through Oxfam. Add in a little chocolate Archie the Goat for the person you’re giving the goat on behalf of for £4.99. We all need a bottle of port in the house for Christmas, where would the cheeseboard be without it? How about treating the foodie in your life to their very own bottle, engraved with a personalisation. There are various styles (of port and personalisation) available from GiftsOnline4U, this one is £33.99. For anyone who enjoys spirits as their tipple of choice, this is a super gift. Each month a box arrives on a given country theme, with a selection of drinks and a mixer to try. Try everything from local classics to old favourites. Each hamper comes with a collectable menu full of facts, including food pairings, tasting notes and local insights – so you can enjoy your Tipples just how the locals do. £14.99 per month. A brilliant (and affordable) way of sending a special festive message. You can design your own personalised label online and choose from a good selection of wines. A really unique and fun way to say a special thank you or send Christmas wishes to a wine lover. From £12.50. For those of us who have tried to grow veg but can’t quite get there, these are the perfect solution. Your very own Oyster mushrooms, within 2 weeks! The kit recycles used coffee grounds so is super environmentally friendly too. A great gift for an experimental foodie. £17.95 each. This was a late addition to the guide as I’ve only just spotted it, but doesn’t it sound amazing?! I’m not usually a vodka fan but I am planning on making an exception for this. A super Christmas tipple sitting by the fire with a mince pie.. A super alternative gift for chocolate lovers. £15.00. 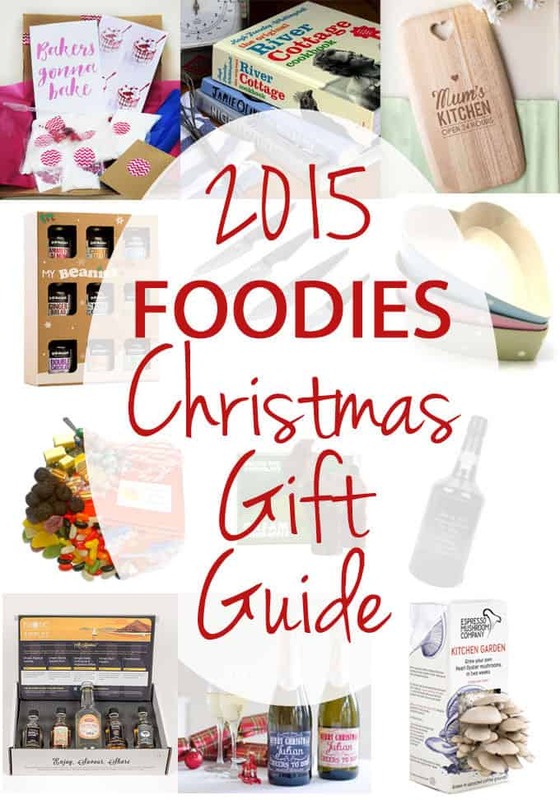 What’s on your Christmas list this year and what are you buying for the foodie in your life..? Disclosure: I was kindly sent some of the products in this guide, free of charge, to test out and some are what I’ve been buying myself for friends and family. Products provided free of charge have in no way influenced their inclusion. I’m quite taken by Archie the Chocolate Goat! The coffee set also sounds fantastic as I’m quite into my coffee right now. As it happens I’ve just tried out Exotic Tipple myself. Think they make a great gift. Great guide, love the suggestions. What a great selection! I love the various subscription boxes and clubs you’ve mentioned. Lovely gifts that last well beyond the festive season. I love the look of some of these, the heart shaped oven dishes are just adorable. Oooh, I love the look of those seasonal coffees. I might get some of them as a stocking stuffer for my husband. Great gift ideas! I love the personalized chopping board, so cute!